Roulette is an exciting casino game in which you can apply a betting system successfully. What makes the game so suitable for various types of betting systems is the fact that the whole gaming process revolves around players placing wagers on the numbers of their choice. Nowadays you have the chance to take advantage of many betting systems and minimize your losses to a great extent. All of them feature a plan which you can follow and alter your bets according to it. This way, you will no longer rely entirely on luck as your wagers will be in accordance with the respective pattern. One of the most popular and efficient systems that can help you make wiser betting choices is the Parlay betting system. It is believed that it was invented during the 16th century which makes it one of the oldest betting systems that is still used today. Apart from roulette, the system can be also applied in other well-known games such as blackjack, craps and baccarat, providing that you take your time to make the needed adjustments. This system can be found under different names, including Let it Ride and Pyramid betting system. Now, let’s take a look at its basics and what makes this system so widespread on a global scale. Many players confuse the Parlay betting system with the Paroli betting system, perhaps due to the fact that both systems are positive progression ones. In this type of systems, you are required to increase your stake whenever you win and decrease it whenever you lose. In the gambling world, the term ‘parlay’ is used when players wager their original winnings to turn a bigger profit. This system gets its name from it since it is based on the exact same principle. If you follow its plan, you will be able to win more money by placing bets from the funds you have won up to that moment. In comparison to other betting systems, this one is considered to be rather straightforward and easy to grasp. There are no complicated mathematical calculations which you have to make during the gaming process and there is no need to remember any difficult patterns. Thanks to this betting system, you can increase your chances of accumulating more money by simply using your winnings. This way, you don’t risk damaging your own bankroll which is surely a great benefit when it comes to games of chance such as roulette. As already indicated, it is fairly easy to apply this system as all it takes is to follow a few simple steps. In order to make this system work and get the most out of it, it is advisable to do some preparation beforehand. Just like in some other betting systems, you need to assign the exact amount for one betting unit before you enter the game. Another important thing which you should consider in advance is your win limit. It is essential to think this matter through as the maximum amount of the funds you want to win plays a crucial role, especially when it comes to this betting system. In this sense, it is really important to set a goal which you have realistic chances of achieving. Otherwise, the winning limit won’t help you retain your winnings and you will most likely leave the game with empty pockets. It should be noted that in such cases, discipline also plays a crucial role as the players who lack this quality find it very hard to withdraw from the game when they are supposed to. You are expected to start your gaming session by placing a bet which equals one betting unit. For the sake of clarification, it will be best to use an example which illustrates the plan of the game quite well. Let’s assume that you start by placing one betting unit which you have set to $10. When it to comes to your win limit, you have decided that $200 is a reasonable amount. 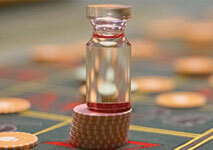 You have also chosen to try your luck by placing an even-money bet on red. At the beginning of the game, the ball lands on such a number and your bet wins. According to the Parlay betting system, in order to determine your next bet, you should always take into account the outcome of the previous round. Therefore, in such cases you are supposed to increase the amount of your wager twice as much. As a result, the size of your next bet is increased to $20. Your winning streak continues as red wins two more times and you have placed two more wagers respectively $40 and $80. You are supposed to continue wagering on red and increasing your bets as long as you are winning. If the next outcome of the spinning wheel is also pleasant for you, you are required to place a $160 bet. After that, there are only two possible outcomes which lead to the same circumstances. If you win once again, you will reach your win limit in which case you should start all over again by placing a $10 bet. In case that you lose, you are required to also wager your first initial betting unit. This applies for all situations in which you lose. The Parlay betting system offers a number of advantages which not many other betting systems have. For instance, its plan is not that risky since you are required to increase your bets gradually. Also, it is very easy to apply this system as its main principle is very straightforward. Thanks to it, you can focus more on the gaming process, instead of wondering what amount you should place for your next bet. This surely contributes to the overall pleasant gaming experience you are able to get from playing roulette and it increases your level of entertainment. However, in order to manage to make this system work, you need to have self-control and discipline. Otherwise, you won’t be able to adhere to your win limit and it is unlikely that you will manage to retain your profit. This system can be very efficient, providing that you follow the aforementioned steps and that you stick to your win limit. If you have trouble limiting yourself from playing, think of the win limit as a way to help you enjoy roulette more. After all, if you manage to put aside a certain amount at the end of every session, you will be able to have more funds for entertainment. Just like the rest of the betting systems, this one also has its drawbacks. Perhaps, one of its biggest disadvantages is the fact that you can never know whether you will be lucky enough to experience a winning streak and reach your win limit. This is the main principle on which the system operates and you won’t be able to make a profit unless you win several consecutive times. This betting system is also considered to be efficient only for short-term sessions and thus, it will be best to withdraw from the game at some point in order to retain your profit. The Parlay betting system is a great way to increase your chances of winning and as a result, enjoy roulette even more. Its plan is simple and fairly easy to follow which makes it perfect for all types of players. In order to manage to apply it correctly throughout the game, it will be best to get familiar with its subtleties and pros and cons. This system can be very useful, however only over a short period of time. Also, bear in mind that it has no impact on the outcome of every round, meaning that the house edge remains the same.